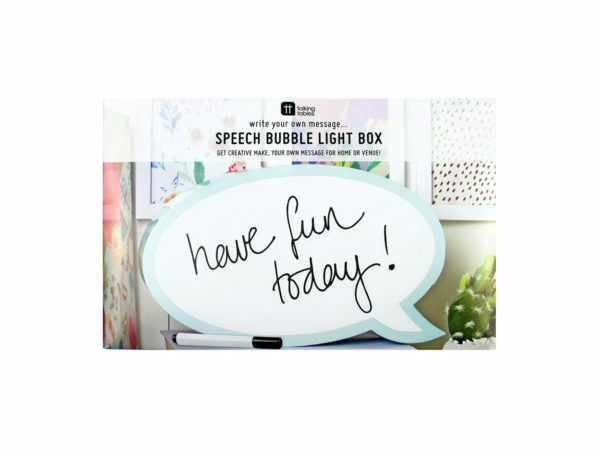 Light up someone's day with your personalized message with this Speech bubble Light Box by Talking Tables. Get creative and make your message for home or venue. The light up LED sign includes a black dry marker that can be wiped away with a damp cloth. It requires 3 x AAA Batteries (not included). The box is 7.5" x 11.6" x 2.4" and weighs 1.1 lbs. It comes packaged in a 7.50" x 11.50" x 2.50" box.